This is a model powered by a liquid-cooled 4-stroke SOHC, single-cylinder, 4-valve, 660cc fuel injection engine on a machine that proposes a "Roadster Motard." Like the V-twin model MT-01 released in 2005 as a European market model, this model was developed with "Kodo" (pulse) as its key concept and featuring an engine with outstanding response and a wide torque band on a new-design body to provide a sharp and exciting ride. 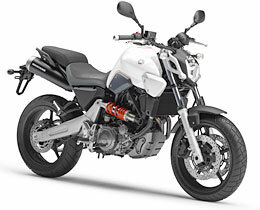 It is characterized by its large-capacity air cleaner, and aluminum oil tank that contributes to concentration of mass, a mono-chamber up-muffler, a new-design diamond frame and a rear shock absorber positioned beside the engine. 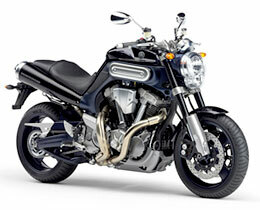 This model is manufactured at Yamaha's Italian production base, Yamaha Motor Italia. Released in 2005, this model is based on the Kodo = MT-01 concept model introduced in 1999 and was developed around the key words "Soul Beat V-twin Sports" with the latest technologies throughout its design to create "the ultimate hobby machine" for motorcycle lovers. It mounts a 1,670cc V-twin engine developed for unmatched sense of pulse and powerful torque as well as exterior styling like no motorcycle before and an unquestionable look of quality.